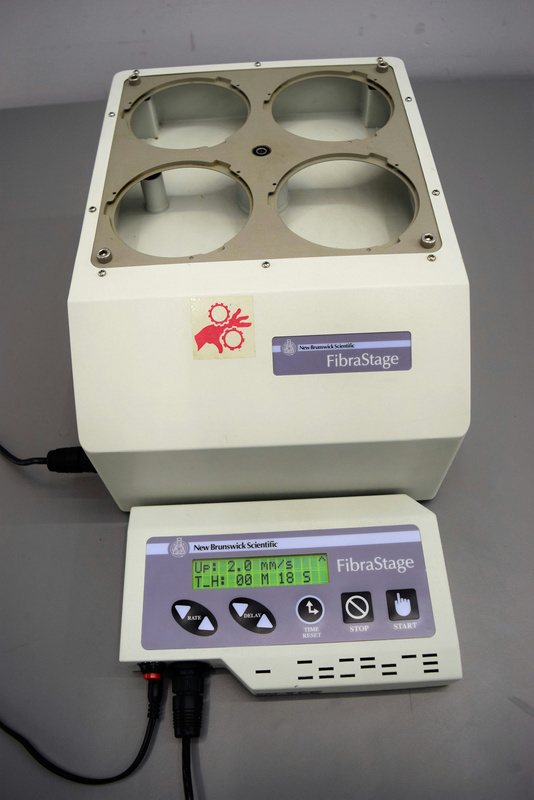 New Brunswick Scientific FibraStage Lift Table w/ Controller Cell Culture System . New Life Scientific, Inc.
New Life Scientific technicians tested that this product demonstrates basic functionality. The platform raises and lowers with no problems. Buttons perform with no difficulty. No bottles or disks are included with this system. The FibraStage is capable of producing large quantities of protens, momclonal antibodies, virus, whole cells and cell components. Eliminating the need for numerous spinners, roll bottles and T-flasks, the system features a solid support growth matrix that provides a low-shear, foam-free environment with a high aeration rate and extremely high surface area for cell growth. The FibraStage system is comprised of a console with an adjustable-speed platform that compresses and expands at the base of each bottle. During compression, media is forced up through the disk bed, facilitating nutrient feeding and removal of waste. In the down cycle, media recedes, so that cells are exposed to air and gasses for efficient gas exchange. Tested, good working condition. Very minor cosmetic wear.